Unzip Google with Interactive Zipper Doodle: Who's Gideon Sundbäck? 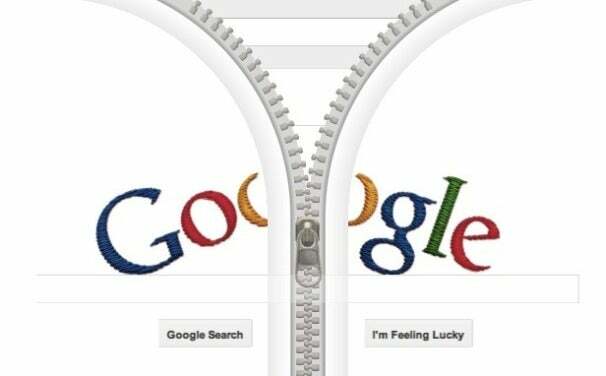 Surf Google's homepage this morning and you'll notice a photorealistic metal zipper bisecting a stitched-in version of Google's logo from page top to bottom. Click the zipper slider and the page splits in two, the slider falling along the zipper's teeth as each side falls back to reveal the doodle's inspiration: Gideon Sundbäck. Sundbäck was the Swedish-American credited with developing the zipper, of course. He was born in 1880 to parents who farmed in Sweden, eventually moving to Germany to study engineering before emigrating to the U.S. in 1905 where he took a job with Westinghouse Electric. Shortly thereafter, he left to work for the Universal Fastener Company, where he became head designer. It was at UFC that Sundbäck spent seven years perfecting a fastening device based on designs reaching back to the mid-19th century, ultimately inventing the modern zipper in 1914. The name "zipper," however, came from B.F. Goodrich Company (now The Goodrich Company), who put Sundbäck's device on rubber boots and eventually tobacco pouches. While we think of the zipper today as part and parcel of the clothing industry, it took two more decades for the world to view it as such. Tuesday's Google doodle works with IE9, Firefox, and Google's Chrome browser utilizing HTML5 and the Canvas feature that allows for allows for dynamic, scriptable rendering of 2D shapes. Google engineer Kristopher Hom, who helped create the doodle, told USA Today: "We like to play with the idea of the home page and try to surprise the user."